Home Blog Choosing the Right Casters: How Much Force Is Required to Move the System? Choosing the Right Casters: How Much Force Is Required to Move the System? For effortless movement of your gantry system, using the correct casters is key. At Spanco, we commonly quote three types of swivel casters: polyurethane, nylacron, and pneumatic. Each type of caster comes with its own set of pros and cons. However, which one is best for your system? The materials that each caster is manufactured with functions differently depending on the environment. The overall goal when using a Spanco Gantry crane, as well as any overhead crane system, is to increase your workplace productivity in a sufficient manner. That is why using the proper casters for your specific application is important. Using the wrong type may result in greater force needed for movement, injury from straining, or loss of loads due to instability. Choosing the proper casters affects the ergonomics of your work facility. Pushing a gantry system opposed to pulling is safer and more efficient. Pulling can increase chances of injury due to the stretched and unsupported position of a worker’s arm and back. The backwards motion and the amount of force being exerted when pulling materials and machinery can result in getting run over by equipment. These dangers are amplified because pulling the system means you can’t see where you’re walking. Having the correct casters for your application will prevent unnecessary hardship by allowing for less force to be used. Polyurethane casters are the low maintenance option for your system. Constructed with little tread, this type of caster is most beneficial in an indoor application. Compared to pneumatics’ rubber tread, polyurethane has a low rolling resistance, which allows for the material to glide over smooth concrete surfaces with relative ease. 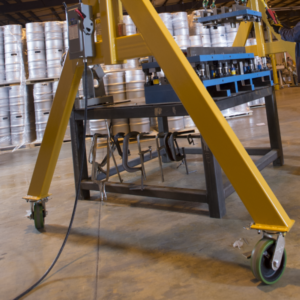 The amount of force to initiate movement for a Spanco Gantry that uses polyurethane casters is approximately five percent of the system’s rated capacity, approximately two percent to continue moving, and approximately seven-15 percent of the system’s rated capacity to turn. 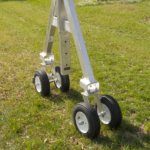 While the solidity of the casters makes for easy motion, if used in a terrain that is uneven, the small wheel diameter and hardness of tread would make your gantry system difficult to push over surface irregularities. However, the rated capacity for polyurethane can far extend past what a rubber tire can handle. Overall, polyurethane casters require little relative force for motion and have strong weight capacities, but can only be used on smooth, level surfaces. Nylacron casters are best used for heavy-duty applications as an ergonomic alternative to motorization. Manufactured from compressed cast polyamide, this material can handle heavy capacities at the lowest rolling resistance. The rolling resistance for these casters allow for easier movement in indoor applications like with polyurethane casters. Nylacron casters are easy to maneuver compared to polyurethane casters and pneumatic tires. To generate initial movement, the force required is approximately less than one percent of the system’s rated capacity, approximately less than one-half percent to continue movement, and approximately three-five percent of the system’s rated capacity to turn. The strength of this material enables a high-rated capacity with the smallest amount of effort to move the system. Pneumatic tires are pressurized tires that contain a flexible tread for shock absorption. These tires are the same type that would be used on your car, motorcycle, ATV, or other vehicles used for uneven outdoor conditions. Pneumatic tires fair better on pavement compared to polyurethane casters because the tread allows for a cushioned roll. Pneumatic tires can either be foam-filled or air-filled. There are benefits to both options, but the choice will boil down to what is right for your application. Foam-filled tires are a sturdier alternative to air-filled tires that can deflate. When employing the air-filled tires, you must monitor air pressure and be wary of punctures. While foam-filled tires are more durable, they are heavier and require more strength to push your system. Due to the solidity of the tire, foam-filled tires do not have the cushioned and smooth ride that air-filled tires provide. A downfall when using both kinds of pneumatic tires is they require more force to start motion. Due to the flexibility of the air-filled and foam-filled tire, it requires approximately 15-20 percent of the system’s rated capacity to initiate movement, continue movement, and turn. It is also harder for the wheel to pivot, meaning more force is needed to turn your system. Additionally, the rated capacity is incumbent on the size of the wheel. Therefore, purchasing larger pneumatic tires for greater capacities is necessary, while nylacron or polyurethane casters can handle larger capacities. When should you use a polyurethane, nylacron, or pneumatic caster? The answer lies in the use you need to get out of your Spanco Gantry system. The force needed for these casters can sometimes be compared to pushing a skateboard and pushing a cart. The purpose of your system ultimately will enable you to determine which caster is necessary to achieve the motion you desire. Kristina Harman was the former senior technical writer and content manager for Spanco, Inc. Kristina has twelve years of experience in content development, technical communications, and copyediting. She holds a Bachelor of Science Degree in English from Towson University and a Master of Education Certification in English from Johns Hopkins University. She is a member of the Society for Technical Communication and the American Medical Writers Association.